Dr. Vandana Shiva advocates for a more equitable and sustainable food system that uses indigenous knowledge and a wide diversity of crops. 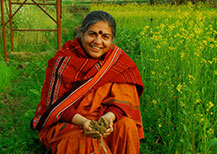 She sees a return to nature and organic methods of farming as a solution for both food insecurity and climate change. As a founder of the Navdanya initiative she has established seed banks around India and programs to teach farmers organic techniques. Shiva links the degradation of the food system to the marginalization of women, and she is often seen as a leader of the global feminist movement for her work to elevate the importance of female farmers. In her lecture Shiva will touch on the connections between sustainable agriculture and conservation and link intersectional feminism with environmentalism.